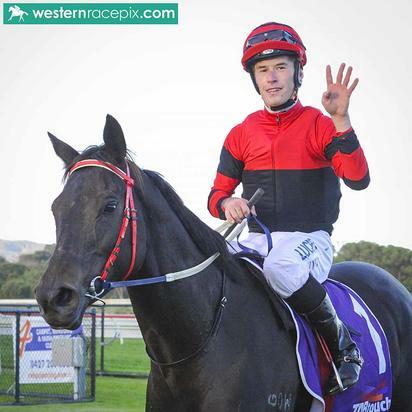 SJ Wolfe Racing's fantastic Great Southern season continued at Albany today with a winning treble. Saddling up nine runners on the day, Team Wolfe were able to produce Bentley's Brother, War Ksar and Red Noire (pictured), and take the stable's record in the region to 30 winners from 178 runners, with the final meeting of season 2017/18 coming up next Friday May 11. Promising three-year-old Bentley's Brother scored an overdue victory in the Rural Focus Maiden (Race 1-1500m), thanks to an aggressive ride from Peter Hall. More than capable staying six-year-old War Ksar has raced without luck recently, but the planets aligned with Peter Hall driving him through along the inside rail to salute by the narrowest of margins in a thrilling three-way photo finish to the Drive Home With Cliff Handicap (Race 5-1920m). And it was left to in-form apprentice Brodie Kirby to end the day on a high with the well-fancied Red Noire in the Give Me 5 For Kids Handicap (Race 7-1600m), and the young gun didn't let the team down, producing a brilliant rails-hugging ride to come from last and score by 1-1/4 lengths.